The Ming and Qing imperial tombs are natural sites modified by human influence, carefully chosen according to the principles of geomancy (Fengshui) to house numerous buildings of traditional architectural design and decoration. They illustrate the continuity over five centuries of a world view and concept of power specific to feudal China. The Ming Dynasty (1368-1644) Xian Tomb is the burial site for Prince Xingxian and his wife, parents of Emperor Jiaqing (reigned 1522-66). They were buried together at Mt. Songlin in present Zhongxiang County, Hubei Province. The Dong Tombs of the Qing Dynasty (1644-1911), the first imperial tombs established by the Manchu rulers, are located 125 km east of Beijing in Zunhua County, Hebei, and occupy an area of 2,500 square km. The Xi Tombs of the Qing Dynasty are located among the mountains some 100 km west of Beijing. This site is smaller than that of the Dong Tombs and with fewer emperors and empresses buried. The Temple of Heaven in the southern part of Beijing is China's largest existing complex of ancient sacrificial buildings. Occupying an area of 273 hectares, it is three times the area of the Forbidden City (must-see for China tour deals). It was built in 1420 for emperors to worship Heaven. The principle buildings include the Altar of Prayer for Good Harvests, Imperial Vault of Heaven and Circular Mound Altar. The Altar of Prayer for Good Harvest, 38 meters in height and 30 meters in diameter, stands on a round foundation built with three levels of marble stones. This towering triple-eave hall is under a three-story, cone-shaped glaze-tile roof in blue color crowned with a gilded knob. A circular wall of polished bricks known as the Echo Wall encloses the Imperial Vault of Heaven. The Circular Mount Altar, south to the Imperial Vault of Heaven, is where the emperor prayed to heaven. At the center lies a round stone called the Center of Heaven Stone that echoes when a visitor speaks loudly when standing on the stone. The Temple of Heaven was entered into the world cultural heritage list in 1998. The Summer Palace in northwest suburban Beijing (the city of 72-hour China visa free) is the largest and most complete imperial garden existing in China. It was first built in the 12th century as an imperial palace. Renovation and extension in the following several hundred years till the end of the 19th century led it into the scale we see today, and was officially named Summer Palace. Occupying an area of 304 hectares, the Summer Palace features hilly and water scenery. The Kunming Lake makes up four-fifths of this royal park. The Long Corridor running east-west along the lake as well as the Pavilion of the Fragrance of Buddha, the Sea of Wisdom, and the Hall of Dispelling the Clouds and Suzhou Street standing south to north on the Longevity Hill are the major scenic spots. The Pavilion of the Fragrance of Buddha, 41 meters high, is decorated with glazed tiles. Its walls were carved with 1,008 niches and images of Buddha. The Marble Boat at the western end of the Long Corridor is a noted structure on water. Built in 1755, the boat, having a length of 36 meters, was made completely out of marble. There is a mirror on each of its two decks to reflect lake water. Sitting before the mirror gives a feeling of sitting on the ripples of water. The Summer Palace was added to the world cultural heritage list in 1998 to make contribution to China tourism. Qufu, Shandong Province, is the hometown of Confucius (551-479 BC), a great thinker, statesman and educator in China's history, and founder of the Confucian school of philosophy. The place abounds in cultural relics, of which the most famous are the Confucian Temple, Confucian Cemetery and Confucian Family Mansion. The Confucian Temple, in the center of Qufu City, was built in 478 BC. There are still 466 halls, pavilions and other rooms intact, covering a total area of 21.8 hectares. Repeated improvement and expansion has turned the temple into a palatial complex with nine rows of courtyards. The Great Accomplishment Hall, the major structure of the temple, is 33 meters tall. It is roofed with yellow glazed tiles and has octagonal eaves. The front 10 stone columns are carved with dragons. In addition to a statue of Confucius, the hall also houses stone inscription of the Ming Dynasty, which tells the life story of Confucius in 120 pictures, as well as a great deal of stone tablets. The Confucian Family Mansion, right next to the Confucian Temple, was the residence of Confucius' descendants and also the residence just next to the imperial palace in scale. Covering an area of 120,000 meters, the family mansion now houses a large number of documents, files and cultural relics. The Confucian Cemetery, occupying more than 200 hectares, has served as the family graveyard of Confucius and his descendants for more than 2,300 years. Together, the Confucian Temple, Confucian Family Mansion and Cemetery were made part of the world cultural heritage list in 1994. In December 1929, a Chinese paleoanthropologist named Pei Wenzhong discovered a complete skull of "Peking Man" on Dragon Bone Hill northwest of Zhoukoudian, in the southwest suburbs of Beijing. Later, archaeologists unearthed 40-odd individually fossilized skeletons of "Peking Man", male, female, old and young, all at the same site. Zhoukoudian, therefore, became the most common site for human remains with the most abundant fossils in the world from the same period. The discovery pushed the history of Beijing's civilization back to some 600,000 years. These fossilized remains prove that "Peking Man" was primitive man in an evolutionary process from ancient ape to modern man, and is the ancestor of the Chinese nation. 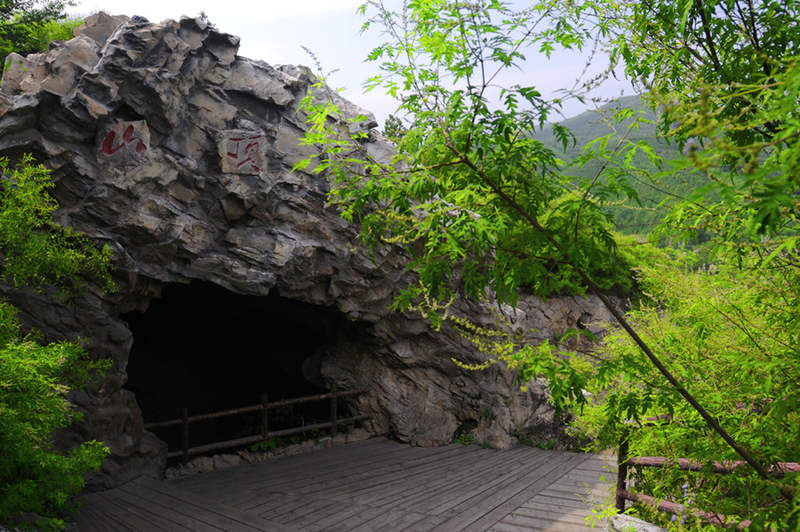 Inside the 140-meter-long Peking Man Cave, stratum accumulation was of a depth of 40 meters. The inhabitants spanning more than 300,000 years left their remains, stone tools and traces of fire here. On Dragon Bone Hill were also found fossilized remains of Upper Cave Man, who lived 18,000 years ago, as well as sites of New Cave Man, who lived between Peking Man and Upper Cave Man. In 1987, the Zhoukoudian caves were listed as one of the world cultural heritage sites.For more others of Beijing via China guide.